This case study is on a Tancho from the May 14 kohaku spawning. 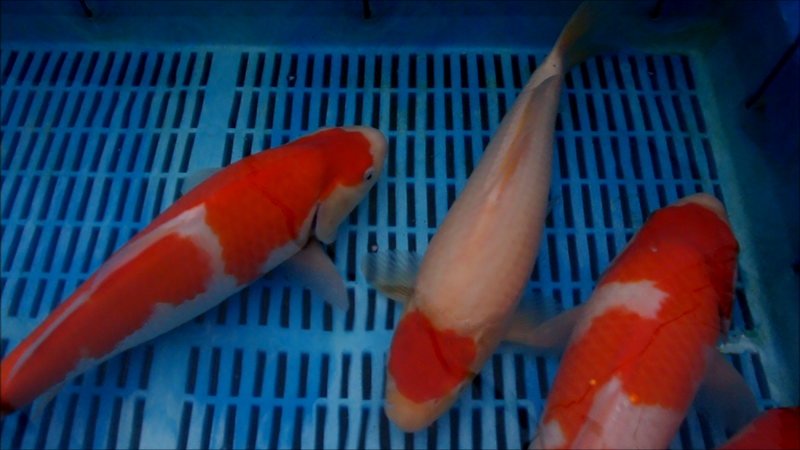 At the point of writing, this koi is 10 months old and the most recent video and picture shows the koi at 9 months old. Out of c.22k fry at 1 inch harvested on this spawning, there were around 10 - 15 or so tancho. I didnt count them at the time, so this is an approximate number. I currently have 3 I am still growing on from this spawning. The one in this case study, the 'harry potter' tancho and another tancho where the red comes too far down the nose. I released 4 at the last selection point - these all had stable tancho spots, and the other 3 or so were selected out at earlier selections - for reasons such as tancho spots that drastically diminished or dissapeared. 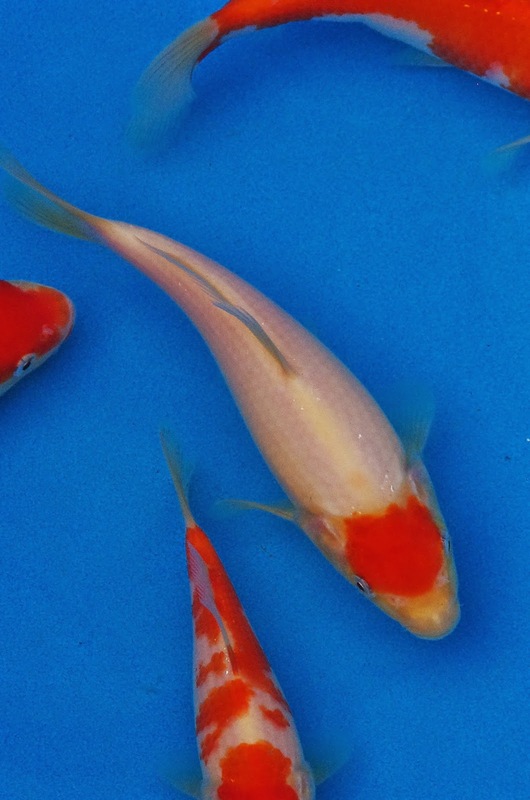 To add to the discussion - there were also 3 koi that were technically maruten kohaku but looked very much like a tancho but with a single small patch of red on the body; I selected these out in November 14 - ie just before the best 100 or so were selected in to grow on over the winter in a heated tank. Ok, back to the koi in this case study. - the underlying red mark on the shoulder; it's feint but clearly visible and the photos do pick it up. And overall, the skin was less white and silky looking than the whitest and most silky looking peers. - the body shape - at the first picture, as you cast your eye from nose to tail; when you get to the dorsal area there's a tapering / narrowing off that appears a little bit too much. 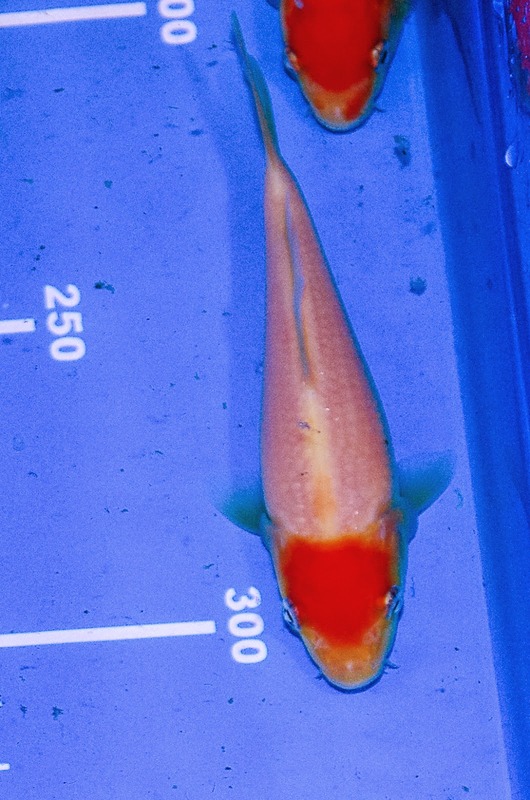 Compared to other koi at the same age at the same selection - this tapering off was not present in the better ones. - the shape of the tancho mark. this is the red marking on the head. early on, the edges appear smudged, most noticeably on the edges at the back of the head. the edges of the pattern towards the nose are more clearly defined. this was the only tancho with the smudged pattern edges at this selection point - the other's had sharper edges to the red marking. 8th August 2014. I have pictures of tancho's before August but it's only at that point that I can be certain of identifying this particular one. At this point, the edges to the tancho marking have become sharper. The underlying red smudge on the shoulder is still erhe and the white ground still looks less white than it's peers. The narrowing of the body at the dorsal area has become less marked, but is still noticeable. The tancho marking edges are sharp, and it's interesting to see how the line made by the edge of the tancho marking at the back of the head has changed since November 14. It's tended towards a straighter line. Skin wise - well, you can see the difference in whiteness of the white in the video. I think the yellowing from the early pictures has lessened and I can't see the red smudge on the shoulder anymore. But most of it's peers are sporting a whiter and silkier looking white ground. Body shape wise, well the narrowing at the dorsal has become even less marked, and to be honest - I thought it would go the other way. But that's why I track it! I don't think the story is over though, and I'm still growing this fish on so less check it out at the next selection point in May.